Everyone thinks they know about Roe v. Wade (1973), the landmark Supreme Court case that won women the right to a safe and legal abortion. Yet few are acquainted with the people involved in the case. Mixed Blood Theatre’s “Roe” is written by Lisa Loomer, also the author of Macalester’s fall semester Theatre and Dance Departmenal production, “Distracted.” Directed by Los Angeles native Mark Valdez, “Roe” follows the story of Norma McKorvey (Tracey Maloney), better known as Jane Roe, the plaintiff, and Sarah Weddington (Laura Zabel), the young lawyer who took on Roe v. Wade as her first ever case. Loomer also regularly calls out the elitism embedded in second wave white feminism. Lawyers Sarah and Linda Coffee (Kate Guentzel) are criticized for caring about legalization of abortion more than helping Norma. The court decision comes too late for her to get the abortion she so desperately wanted, which becomes a major point of contention for the two narrators. Additionally, Norma had almost no involvement in her own case (in order to protect her anonymity, according to Sarah), to the point that she learned about the Supreme Court decision by reading the newspaper. While Sarah repeatedly expresses gratitude for Norma for agreeing to be the plaintiff, that gratitude does not translate for Norma, who feels used. The second half shows how feeling like a pawn of feminism leads Norma to become an anti-abortion, born-again Christian. She felt like Operation Rescue leader, Flip Benham (Michael Booth), and his church group cared about her as Norma, not as Jane Roe. 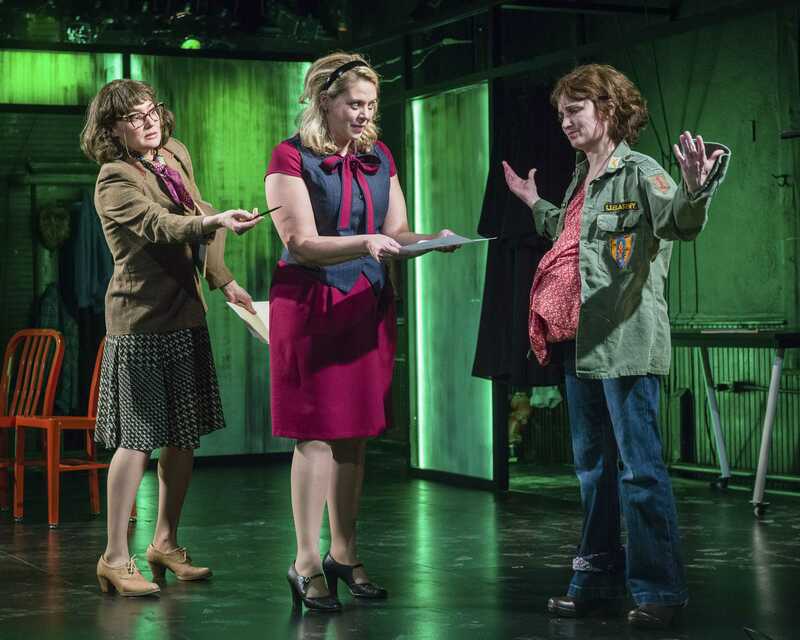 Kate Guentzel, Laura Zabel and Tracey Maloney in “Roe.” Photo by Rich Ryan. The play aims to connect to present-day occurrences. When Sarah and Linda read the decision, they comment on specific phrases that could be used to roll back access to abortions, saying those might come back to bite them. And they have, as these clauses have allowed regulations like Georgia’s recent fetal heartbeat bill, which prevents abortions after six weeks, when a heartbeat is first heard. As the last lines of the play ominously remind us, the Roe v. Wade decision stands — for now. I greatly appreciate that “Roe” made sure not to gloss over important details about Norma that are often kept out of history books, like her abusive mother, persistent drug addiction or that she was gay. The romantic relationship between Norma and Connie (Lisa Suarez) was heartbreaking. Norma perpetually felt exploited by those around her, yet never valued how Connie cared more about her than any Supreme Court decision. Connie’s pain when introduced to Norma’s church friends as her aunt was instant and guttural. Maloney and Zabel both gave amazingly executed performances down to their crisp accents — Suarez’s was my favorite, due to her ability to display complex emotions with very basic actions and expressions. Valdez made good use of technical elements, creating scenes that were visually and audibly innovative. The courtroom scenes stood out especially, with black judges’ robes hung on the set, one per Supreme Court Justice. Real audio from the case was played from different points spread out behind the audience, providing the effect of different speakers in an actual courtroom setting. The music choice for transitions between scenes was unusual and occasionally jarring; the tear-jerking show ended with a Kesha song. Overall, “Roe” was educational, emotional and inspiring. The second half, especially, had the audience in tears. It ran about two and a half hours, including a 15-minute intermission. I was fortunate enough to attend Program Board’s trip, especially since the show was completely sold out. “Roe” closed on March 31, but Mixed Blood Theatre, founded by Jack Reuler ’75, regularly produces plays that address relevant social issues. 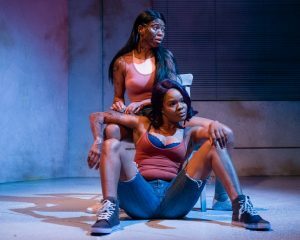 While I am sorry to anyone who missed this play, I highly recommend keeping an eye on their future productions: if this production of “Roe” is any indication, they are likely to be good.